"Thank you for following up. 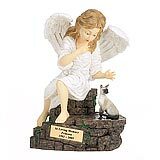 I did receive Jasmine's box and was very pleased with it and the care and respect Angel Ashes takes in preparing the shipment. Your kind thoughts are appreciated - I'll always miss Jasmine but try to draw comfort from my many memories of her." 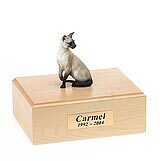 All available Siamese cat urns and memorials will be displayed with the figurine on the Siamese urn you select and in the appropriate size.